It’s hard to define what exactly who or what the Blue Man is, but there is no doubt that it works as a character. 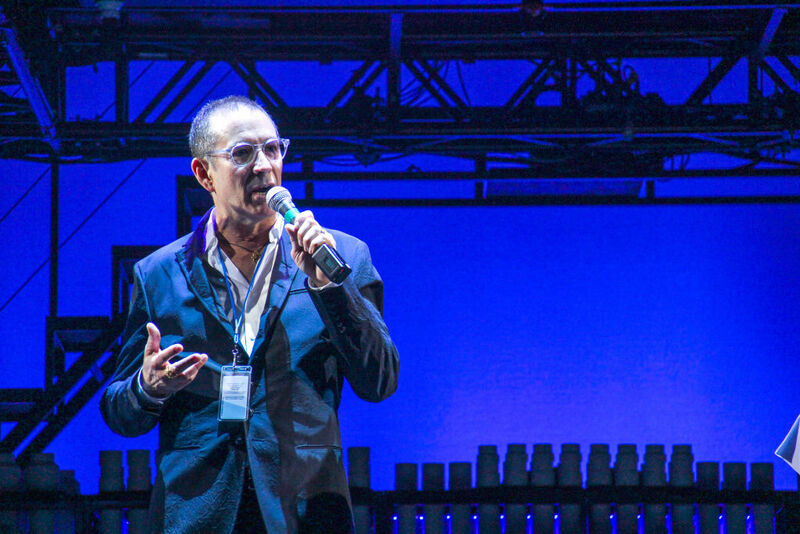 Even Phil Stanton, one of the original founders of the Blue Man Group and part of the original trio, is still exploring the phenomenon of the Blue Man. 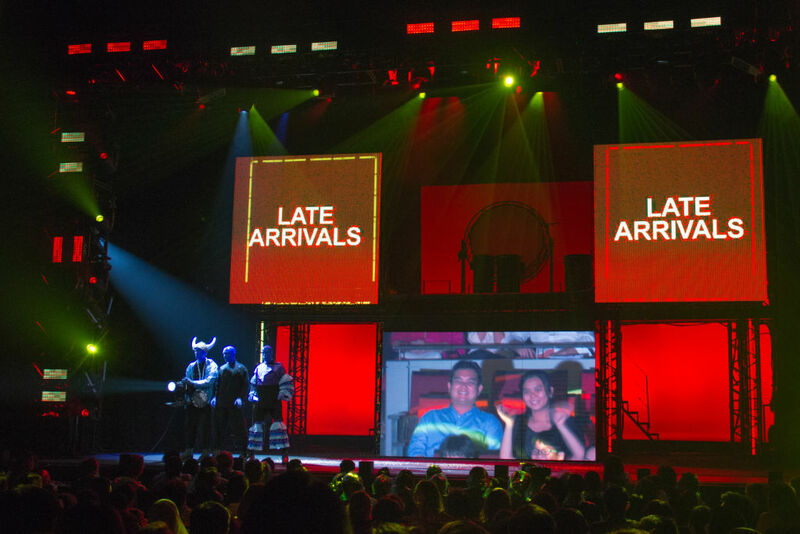 In celebration of their 25th Anniversary, the Blue Man Group hopes to transcend the stage by bringing the production on their world tour. 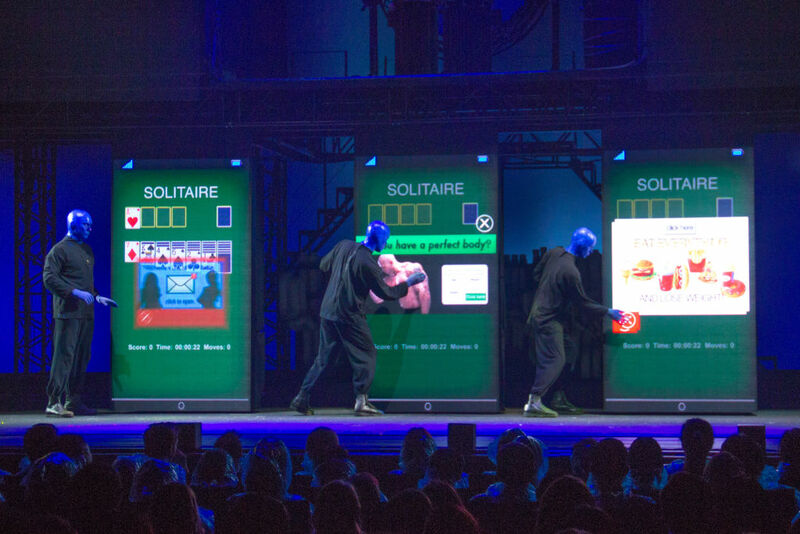 Be amazed by the latest sensational technology, electrifying music by an enthralling live band, and ridiculous behaviors as the Blue Man explore seemingly normal scenarios with their own take on the world. 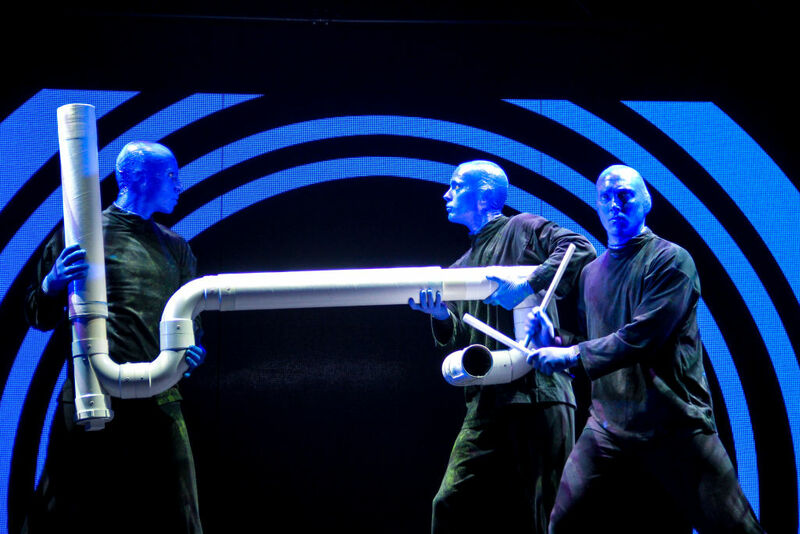 From PVC pipes to art installations to pure drumming, the Blue Man are part musician, part actor, and 100% entertainment. Critique on the ridiculous number of ads in apps. You have to go in with no expectations, because you really don’t know what you would get. Even from the get go, the Blue Man had the whole theatre laughing with their ticker tapes comments like “No Tweelunking, Skytrolling, Flashpuddling, Netcaching, Knobrollicking or Cob-wobbling”. Famed for their improvisational aspect, anything could happen on stage, and we were lucky to be privy to it. Note to concert-goers: do not come late unless you want a spotlight on you as you enter, with your mugshot up on the screens. Even after having watched the show, I still don’t know how exactly to categorize the show, which is a potpourri of comedy, theatre, rock concert, and dance party-esque numbers. But maybe this is what Stanton and the Blue Man Group hope to do, broaching the spectrums of language that restricts our thinking and society to explore our more primal roots. By creating a character without a personal history, with no stereotypes, no restrictions, the Blue Man encapsulates a universal appeal that explains its success. We sat down with Phil Stanton to find out more about this adorably entertaining character overflowing with curiosity. Are you still personally involved with the Blue Man Group? Phil Stanton: Oh yah, yah, that’s all I do. It’s both my job and my passion so I’m really lucky. I don’t perform anymore, but we have, and always have been since the beginning, very involved in the management and business (of the BMG). I wear a lot of hats; Im an HR sometimes, marketing sometimes, General Management sometimes. The accounting part I’m not so great at. Me and my partners, we are trying to spend more time on creative stuff, like the material and stuff. P: Even though this is the first time that we are going around the world, we are always trying to find ways for the character to transcend the stage. We would love to find a film idea for that character, which is very difficult if you are a silent character, but would be really satisfying as a project. There are other characters we are working on that actually do speak like robot characters. There is a lot of stuff that we are working on, but the main thing, and has always been, the BLUE MAN. There’s a lot more we can do on stage and, its strange to say it, but we are still learning about the blue man. We are still trying to articulate what makes it work. So many things have been kind of oral traditions, which are passed down as we train people. There have been behaviors that we haven’t really articulated. These behaviors; are they part of your own behaviors, or is it a Blue Man thing? P: Its probably uniquely personal as an acting project. Like with any good acting and any other theatrical project, you try to connect to who you are. There is something unique to the Blue Man, because the Blue Man doesn’t have any sort of personal history. It doesn’t have a mom or dad, he wasn’t hurt by a girlfriend in school. Normally when you have characters in normal theater, you know their personal history, so you find things about them to connect to yourself, and that’s how a lot of acting techniques work. But with the Blue Man, its something much more primal that you gotta connect to. If you can picture someone with the innocence of the animal, but also has the intelligence of a human who has ever lived. It’s almost like the blue man exists with intelligence and motivations, but not the personal history most people have on earth. The Blue Man is essentially highly intelligent like humans are, but very inexperienced and innocent. It allows you to mirror ourselves, and look at the world with fresh eyes. I often think of it as if you pulled someone from a thousand years ago or even longer, and the human DNA hasn’t changed, and human intelligence also hasn’t changed, but that person would somehow have a very different way of looking at things. Why can’t a marshmallow sculpture be considered art too? 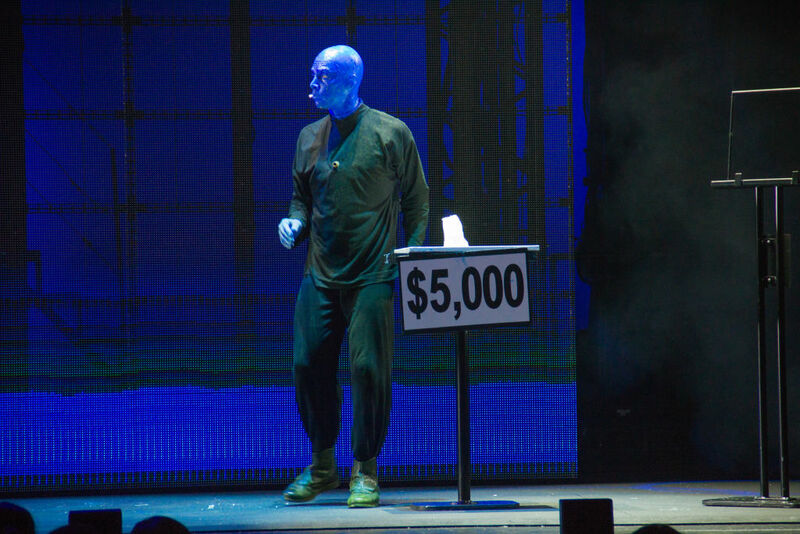 If you had to put it in words, how would you define the Blue Man personality? P: We use what we call these six modalities that make up the Blue Man. There’s the shaman, the scientist (which is the opposite of the shaman), the hero (who kind of wants to get the job done and has higher goals), the innocent (who lives in the moment and has no goals), the group member who’s always trying to fit in (and be part of the group), and the trickster (who is always trying to disrupt the flow and the patterns). We think of the blue man as surfing those modalities, and the most interesting behavior when you try and put those modalities together. If you can picture someone who is heroic but innocent at the same time, it would be quite interesting to watch. Cos that’s what you get if you try to do something stupid. That’s a fire extinguisher by the way, for those who can’t see. Are the actors allowed to explore the modalities that they want? P: The script is written to a certain extent, but it does allow for a lot of improvisation on stage. There are some things they cannot depart from, but there are other things that they are allowed to do. So what are some of the things the Blue Man isn’t allowed to do? P: Well, mainly talk. Like many things about the project, it was at first an intuitive choice. It just seemed like the blue man wouldn’t talk. Now, I think the reason why is that we think that the Blue Man is trying to say something much more primal about humanity. Its almost as if how a human might have been before language was developed. There was a time when we didn’t have language. In terms of an audience experience, it functions to take you out of the side of your head, which is trying to categorize and name, and explain. It allows you to have a more visceral experience theatrically to not have language. But there is a surprising amount of language in the show because even though the blue man doesn’t speak but there are other beings which do. Even the emcee cannot escape the Blue Man. So why was blue chosen out of the whole color spectrum? So, do you miss performing on stage? What was your best performance on stage? P: I do, I do. Some of my favorite experiences were when I was really sick. 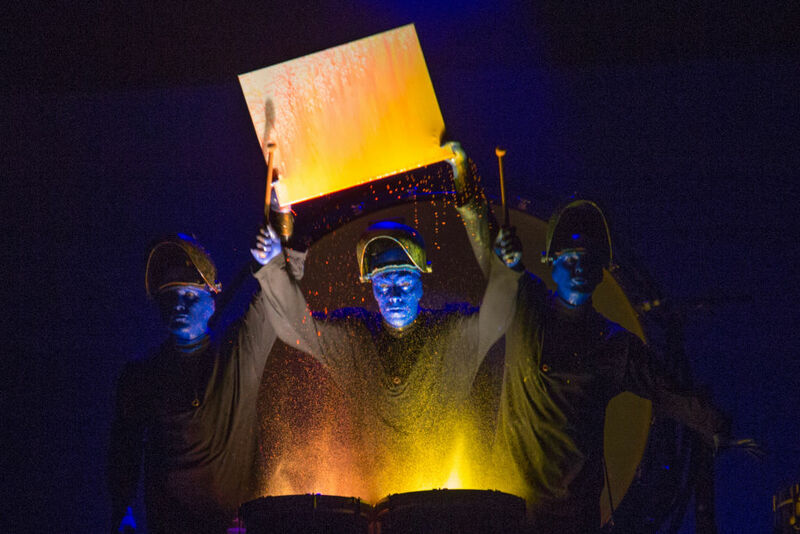 I would be having like a 102 fever, and feel lousy, but there is something about the experience, and this applies to everyone on stage, not just the Blue Man, but being on stage get you this adrenaline rush that makes you feel fantastic for that hour and a half. It is kind of weird, now that I think about it. Wow I should come up with a better answer for that. I think that when you are sick, there probably is another kind of level of focus that makes you feel like you are in the moment. Like, you know, it’s easier to get out of your head and be free to let the impulses flow. 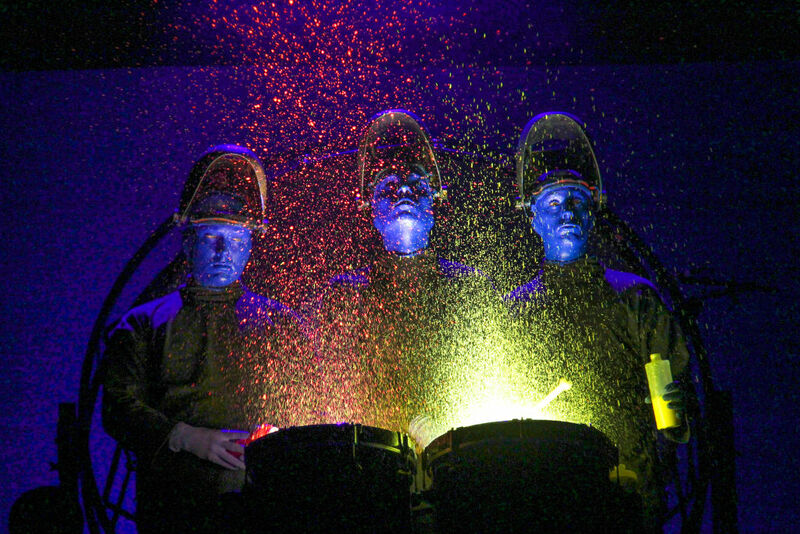 Catch the Blue Man Group from now till 24th April 2016 at the MasterCard Theatres, Marina Bay Sands. Tickets from $90.